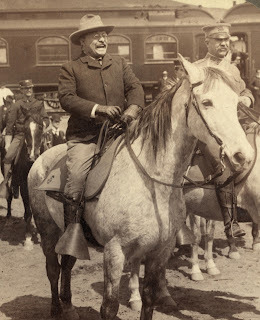 The Midnight Freemasons: Teddy Roosevelt "Get on the Horse!" I’m not much of a shopper, but I’m married to one. My wife and I can go into a store selling nearly anything and I’ll be done looking and ready to go before she’s made it past the first display. 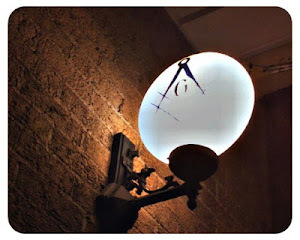 But we both love antique malls, and there our styles complement each other: she’ll look at every item, while I’ll do five laps to see if something catches my eye. Sometimes she’ll see something I’ve missed and show it to me as I run past, and sometimes I’ll find something I think she’ll like and go get her to accelerate her shopping experience. It works for us, we have fun, and occasionally we find something we have to have. Recently, we found ourselves in a consignment and antique shop, and as I was preparing for my customary laps, she pointed at a framed photograph of Theodore Roosevelt and said, “What do you think of this?” It looked like a page cut from a magazine, behind rough glass in a homemade wooden frame, showing a grinning Roosevelt on horseback, looking too alive and vital to just be a record of a moment in 1906. I bought it, took it home, and hung it in my library. Theodore Roosevelt has never been a particular hero of mine, although he’s fascinating to even the most casual observer. I’ve never been particularly taken with his career, although I’m grateful for his championing of national parks. Even among Masonic presidents, he’s not at the top in my personal pantheon (Harry Truman stands there alone). But in that picture he embodies a Masonic quality better than any other public figure of whom I’m aware: doing things with great joy. From his sickly childhood to his early death, Theodore Roosevelt believed in doing things. Whether it was hunting big game, exploring the Amazon, reforming the New York police, organizing a volunteer company to fight in Cuba, using the presidency as a bully pulpit, or just getting on horseback for a vigorous ride, he was never still. He lived each day as if there weren’t enough hours to do all that needed to be done. “Great thoughts speak only to the thoughtful mind,” he wrote, “but great actions speak to all mankind.” He was a truly joyful man of action, and his life spoke loudly to anyone who paid attention. As it still does. So now that picture hangs on my wall, where Brother Roosevelt, still seemingly alive over a century later, reminds every day me that I have things to do, that the opportunity to do them is to be seized, and that I should do it all joyfully. Roosevelt loved all forms of exercise, but it was on horseback that he seemed most fully alive. It might be a metaphor for his remarkable life, and it reminds me daily of his example. That picture tells me to get on the horse, take the reins in my hands, and ride.